Comet Lander, Firefighters Execute Dazzling Feats Above The Earth The sky was full of wonders this week, NPR's Scott Simon muses, as a spacecraft landed on a comet and two window washers were rescued 69 stories above the streets at the new One World Trade Center. 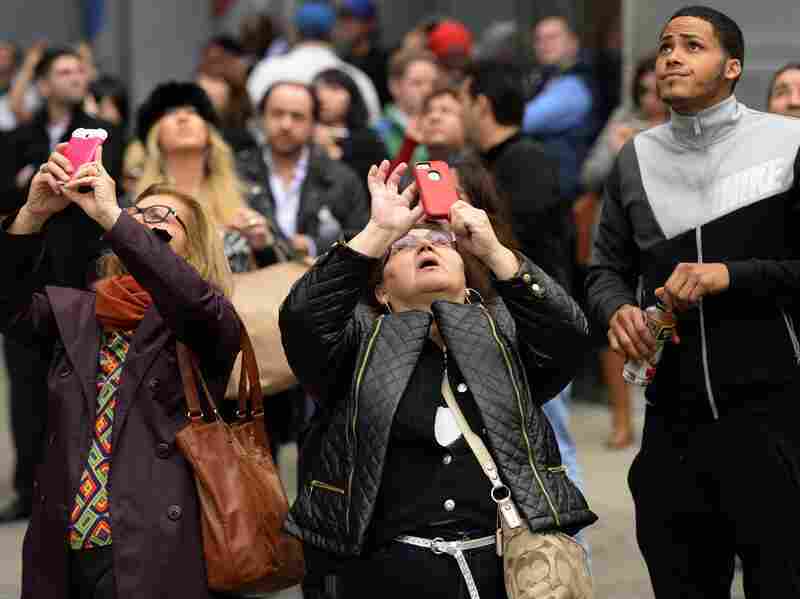 Onlookers take cell phone pictures of stranded window washers hanging from scaffolding on the side of One World Trade Center. Everyone has days in which we wonder if much of anything works. Websites crash. Screens blink, go blank, or taunt: I'm sorry. Try later. We have an unusually high volume of calls. Download to update. Click here if you've forgotten your password. But for a couple of hours on an afternoon this week, people got glimpses of excellence. The Philae lander of the European Space Agency's Rosetta mission touched down on a comet, called 67P, that speeds through the universe at more than 40,000 miles an hour. That's a little like hurling a speck of sand to hit a speeding bullet 310 million miles away. Comets are sometimes called the frozen leftovers of the solar system: crumbs of ice, dust, and rock. The readings Philae sent back may give a clue as to whether comets carried water that led to life on our world, and perhaps others. The Rosetta mission was launched in March of 2004, and Philae's harpoons didn't fire to hold it fast to the comet in full sunlight. It can't power up in the shade, and may go quiet for good. But imagine: technology that worked for more than ten years. And at the very time Philae was settling onto the comet, Americans could also watch a couple of men dangle in the sky. Juan Lizama and Juan Lopez were 69 stories above the streets at the new One World Trade Center. They are experienced window washers and the long, cage-like rig in which they work got stuck in a precarious position after an equipment failure. Experts say they were not in danger of falling; a single cable can support the rig. But One World Trade Center is built on a site that will be known for a long time as Ground Zero. It was hard not to see the dangling rig, think of the daring men inside, and see dauntless professionals from the Fire Department of New York race to the 69th floor to carefully cut a hole through a window — a tricky feat so high up, where air pressure against the glass can make a window pop — and not think of a sparkling day in 2001, when 341 firefighters died so valiantly on that very site. Both firefighters and window washers train for this kind of emergency, no matter how unlikely, and reportedly were calm — even as as many of us watching, below the building and around the world, were anxious. Fire Commissioner Daniel Nigro said, "The firefighters made a difficult operation simple. They are the best." This week, in the same hour, on a sparkling afternoon, you could look up into a spot in the sky and a rock in the stars and be amazed by men and women at work.